to the youtube url. WordPress has a nice feature that embeds video links automatically, so you don’t need to handle messed html code, but that embed show the video title too. 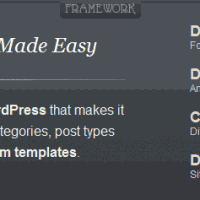 I have decided to improve my skills creating WordPress themes, and the only thing I was sure is that I would need a theme framework in order to be organized and have a solid structure. After having a look at the main frameworks, the chosen one was Carrington. The reason, you can get a quick idea of what it does, it acts like a proxy for template parts, so if you want your home page to have a different header, you just add a new file in the headers folder called home.php and Carrington pick it for you. You can almost forget about WordPress conditional tags and if statements and focus in developing. But that does not always work. In my case, I wanted to have a static page as home of my site, to do so I went to “Settings” > “Reading” on my WP backend and chose the page I wanted to be the home page. I also wanted a new header for this new home page, so I added the “home.php” file to my headers folder, but Carrington just ignored it. Mi nombre es Javier Márquez y soy un ingeniero informático de Sevilla. Me gusta mucho programar y disfruto cuando afronto retos interesantes y proyectos en los que puedo descubrir cosas nuevas. Lógicamente, los ordenadores no son todo en mi vida. Me encanta la música, el flamenco es mi otra pasión y estoy y estaré siempre aprendiendo como tocar la guitarra flamenca. Puedes conocer más sobre mis intereses y preocupaciones leyendo mi blog.